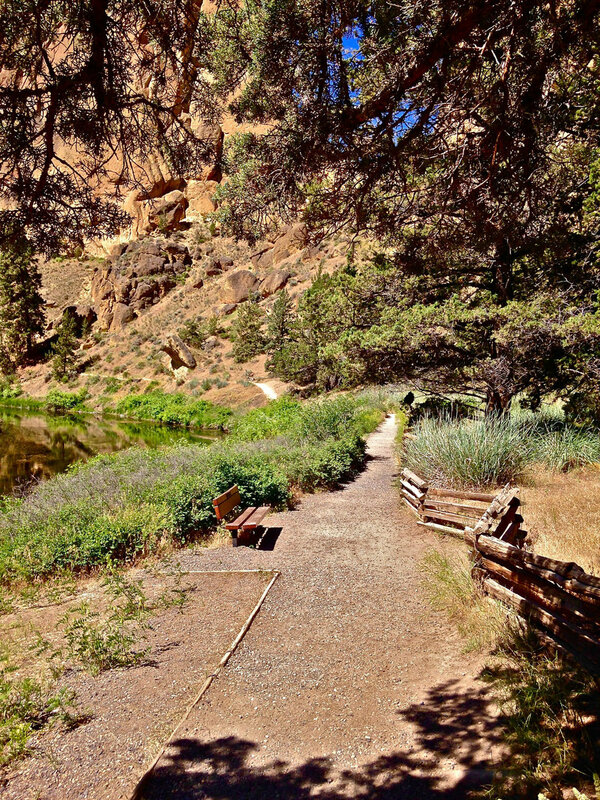 Make a left at the bridge to head out on the River Trail at Smith Rock State Park. You'll cross over several wood bridges on the River Trail at Smith Rock State Park. 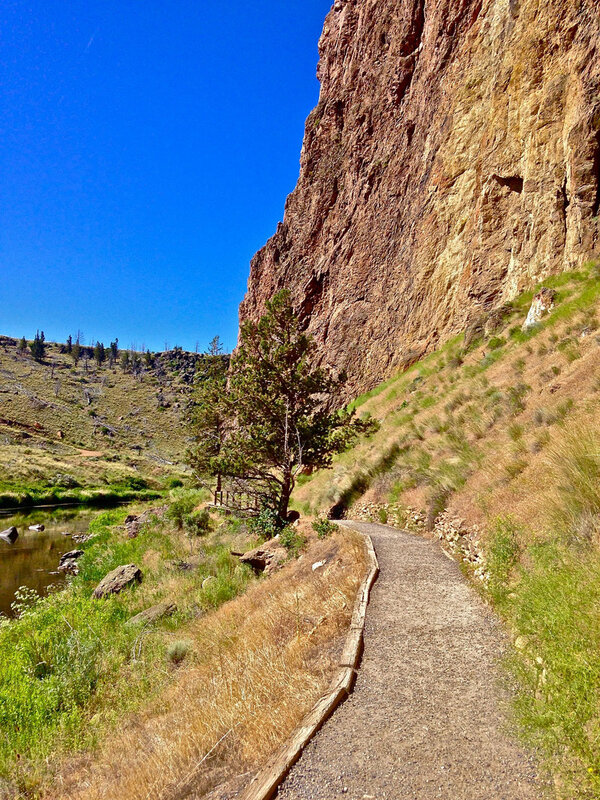 The River Trail path takes you past the big walls and major climbing areas at Smith Rock State Park. A bench on the River Trail and a trail up to a compost restroom allow you to hang out and watch the climbers at Smith Rock State Park. 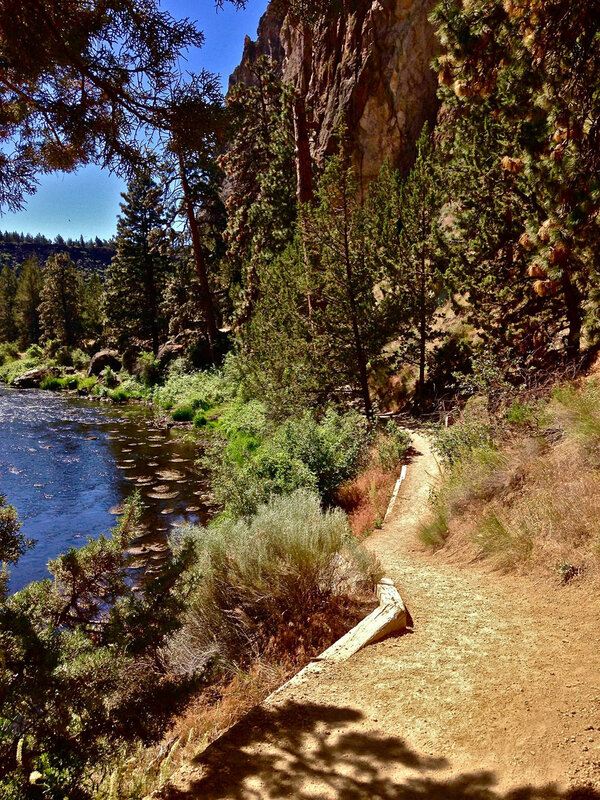 Ducks, otters, and blue heron are often spotted in the water along the River Trail at Smith Rock State Park. The River Trail rises and falls gently at Smith Rock State Park. 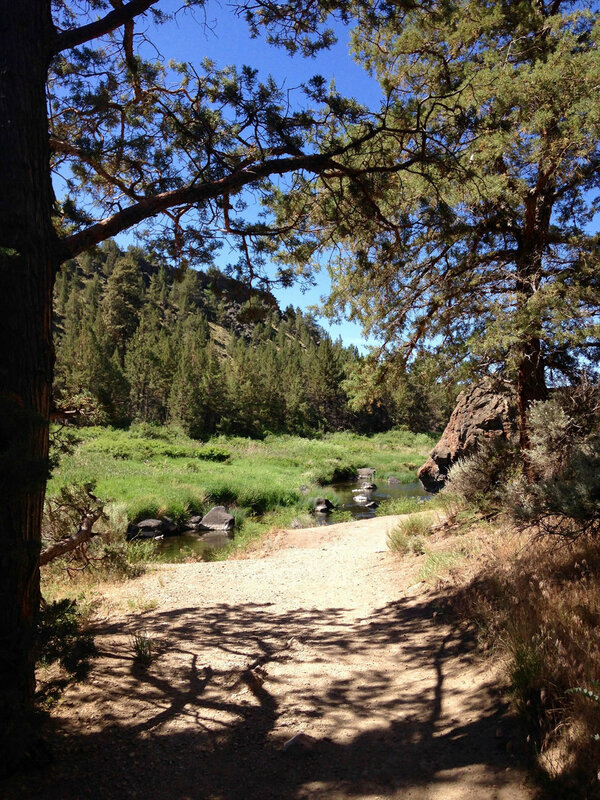 Horses can be seen fording the river as well as deer at the low points of the River Trail at Smith Rock State Park. 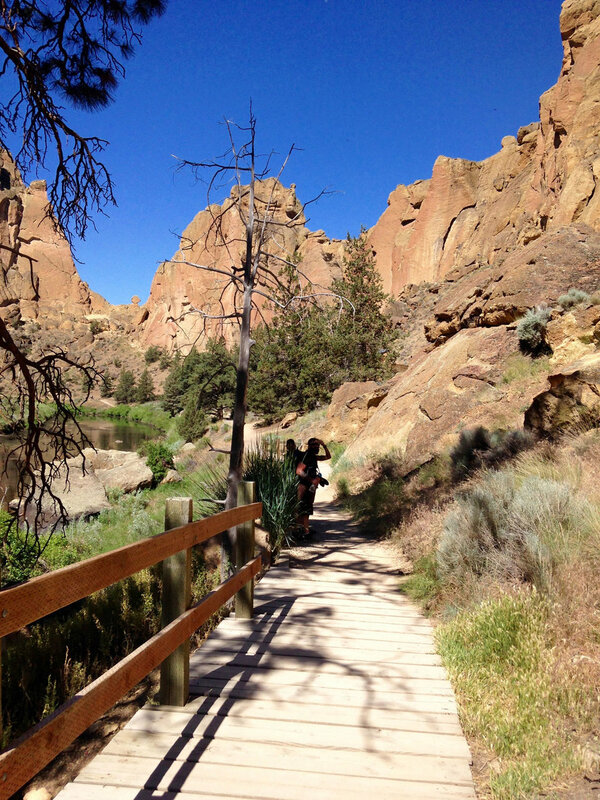 Natural caves with climbing routes nearby make for an interesting journey along the River Trail at Smith Rock State Park. Great views of the iconic Monkey Face pillar can be seen from the River Trail at Smith Rock State Park. 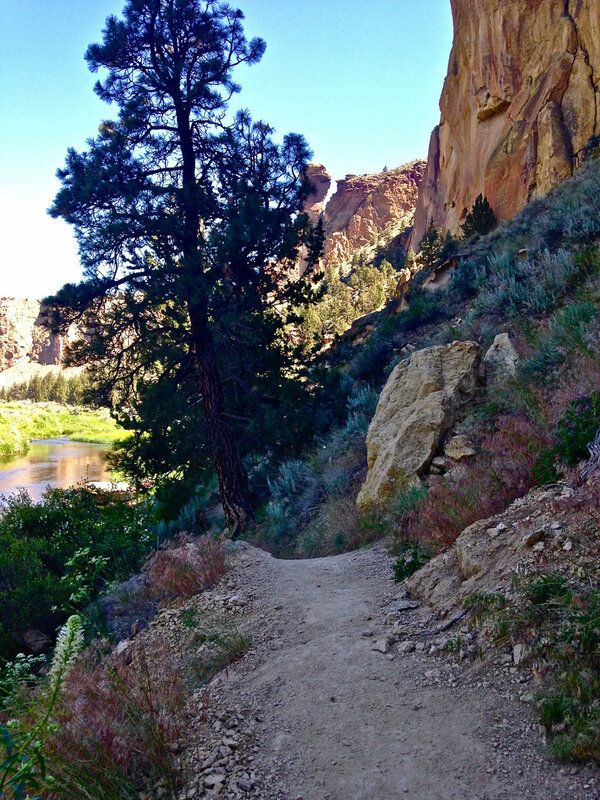 Undulating scree surfaces can be slippery on the River Trail at Smith Rock State Park. 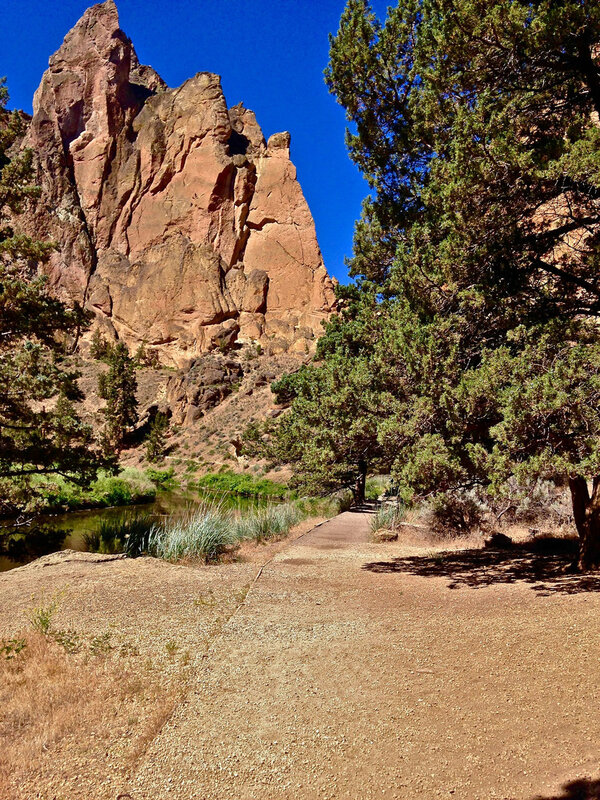 Shade trees along the River Trail keep it cool on the hot days of summertime at Smith Rock State Park. Sign for the Summit Trail marks the end of the River Trail at Smith Rock State Park. NOTE: Horseback riding is restricted between the bridge and the horse ford. Access for riders on the River Trail is via the Canyon Trail and then crossing the river. It starts on your left just after you cross the bridge in the river gorge. First you need to descend into the park from the main entrance by the Welcome Center. 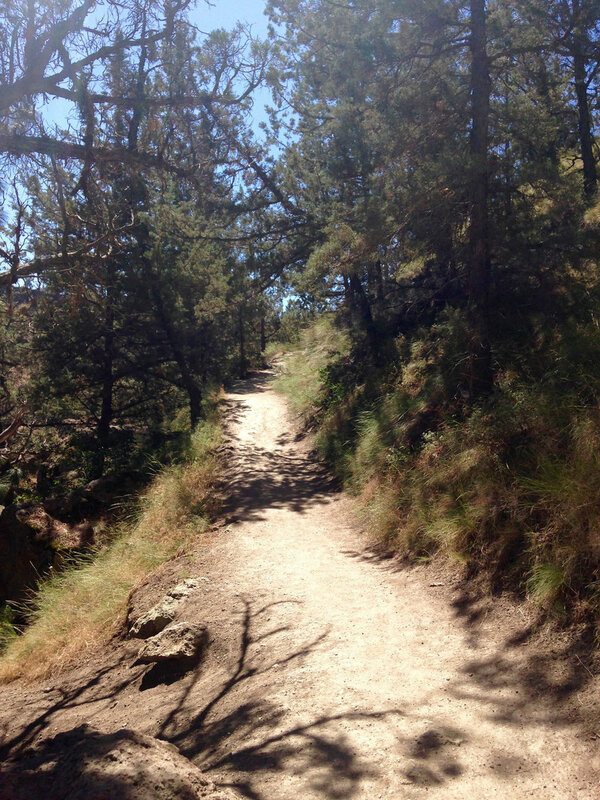 Your two options just past the Overlook are the steep scree Chute Trail, or the more gentle gravel Canyon Trail. Looking straight up at the rock face at the start of the trail, you start to see climbers on routes along Picnic Lunch Wall. As you round the bend, you come to the main climbing areas of Morning Glory Wall, The Dihedrals, and Christian Brothers. There is a compost bathroom nearby should you care to hang out a while on a bench off the trail and watch the climbers. Just past Christian Brothers as you round the bend, look up to your right at Asterisk Pass, marked by a boulder resembling Woodstock from Snoopy comic strip fame. As you continue along the bend you come up on a horse ford, where on summer days you may see them crossing with their riders when the river is lowest. The Smith Rock Group with Phoenix Buttress, another popular climbing area, lies just beyond. As you round the Southern Tip, another climbing spot, you may see deer fording the river. Continuing along the river, you’ll see small grassy islands, where water fowl tend to hang out, as well as the occasional otter family swim by. The trail ascends a bit at this point, but then flattens out quickly along the river’s edge once again. Follow it past the Mesa Verde Trail junction for .49 miles to the Summit Trail/Mesa Verde Trail junction. Great views, including that of a park icon, Monkey Face are all along the way. At this point you can simply turn around and go back the way you came to stay on level ground. See the TIP below for going up for more views and coming back via the Misery Ridge Loop. If you want to get some amazing views from the top, as well as get up close and personal with Monkey Face, hang a right on to the Mesa Verde Trail, for a steep .28 miles. Once at the top, take the .68 mile Misery Ridge Trail along the ridge until it descends down a steep scree path back to the bridge.